I think I was chosen for this part either because of my astute mid-term memory or because a majority of it was colored by my bout with Dengue Fever. Either way, I am honored! The view from our hostel in Guanajuato. As we loaded the bike up with all our gear to leave Sayulita, I started to feel tired and my body was aching. Even as we strapped the last bag on, we searched a couple nearby Airbnb options to look into staying another night. I sat down for a minute and decided I could make the four hour ride to Guadalajara. My health deteriorated from there, but we still rode another hour to a town I can't remember the name of right now. I immediately lay down in the down square while Rachel found us some street food from a flamboyant boy who told her to go see the nearby volcano. The rest of the day went similarly: ride, stop, lay down. By the time we got to the sprawling city of Guadalajara, I had a full on fever. Fortunately our hotel was far and away our nicest of the trip thus far (and for $30/night!) so it wasn't a bad place to wait for the fever to break. That being said, the fact that I was in bed the whole time did keep us from seeing too much of Guadalajara. Rachel playing guitar at our hostel in Guanajuato. After two nights we rode to Guanajuato. I was still tired and achy but the fever had subsided. We were tired of being cooped up in luxury, so we booked a backpackers hostel. Guanajuato colorful and gorgeous, reminding us both of the Italian coast without the water--we are way inland at this point. The hostel was almost directly in the middle of a 350 foot staircase. Hiking the gear down sounded better than up. With the sickness and the new altitude (6,800ft), even going down the stairs with our gear was a challenge. We holed up in a private room on the roof of the hostel and stayed six nights. Rachel was very patient and caring while I tried to make day trips into town. Usually that would result in me realizing I'd gotten in over my head and suddenly needing to lay down again in a very public place. The diagnosis wavered between a flu and Dengue Fever, but eventually I got a rash that matched the internet's Dengue photos exactly and the debate ended. 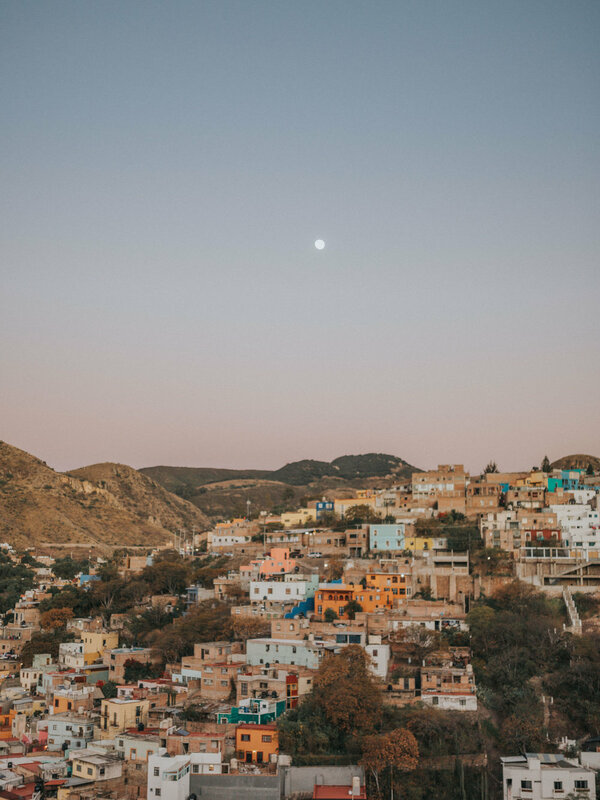 For more pictures from Guanajuato, click here. Christmas Eve in San Miguel de Allende! By Christmas Eve I was feeling better and we rode East to San Miguel de Allende, winner of Travel and Leisure Magazine's “Best City in the World” 2016 AND 2017! I don't know how they decide that, or why they would do it twice to a city--all but guaranteeing that whatever made it special gets spoiled. In spite of the crowds who’d likely read the same article we did, we really enjoyed our stay. Rachel likes crowds more than I do, so maybe it wasn't “in spite” on her side. We were worried shops and restaurants might be dead on Christmas, but that was not the case at all. Many restaurants were open and the main square was packed with people. We had a low-key Christmas, as one of us was recovering from an extra celebratory Xmas Eve. For more pictures from San Miguel, click here. After a couple days in San Miguel, we set our sights on the grandpappy of them all: Mexico City (CDMX for short) and for that story let's turn it over to Rachel. Rachel? Just as Josh hypothesized why it should be he who wrote Part One, I too must wonder why the universe would select me, the longer-winded writer of the two of us, to “wrap up” this blog post. Nonetheless, I will hold nothing back, for Mexico City’s stories are as big and surprising as the city itself. Brace yourselves, readers! Hold on to your sombreros! And bienvenidos a Ciudad de Mexico. 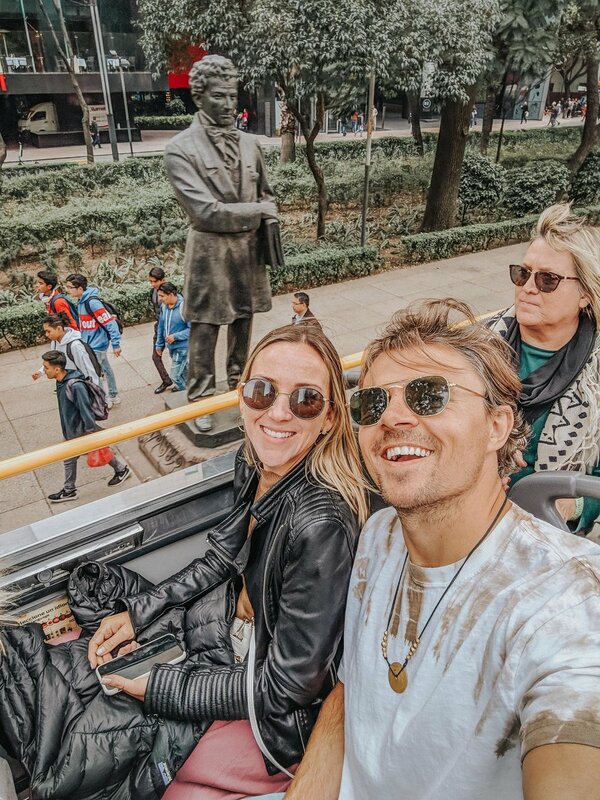 On the CDMX Turibus being total tourists. Upon arrival in Mexico City (known as Ciudad de Mexico (CDMX) locally), we were immediately lost. Not simply because our Google Maps thinks its funny to play direction pranks on us, but because the city itself is a set of arterial main roads that diagonally intersect a grid street plan that periodically wraps itself in concentric circles around plazas and parks. Every time we left our Airbnb we felt like we were in Hunger Games: Catching Fire, as though the streets that branched away from the nearby park were rotating every hour just to mess with us. Walking anywhere became a giant WTF, but we managed to stumble upon our favorite restaurants time after time, again, with no help from Google. (Clearly blowing all opportunities to ever get sponsored by Google with this post). Our Airbnb was situated directly between the neighborhoods of Roma and La Condesa, the “Greenwich Village” and “Brooklyns” of CDMX. The variety and range of what CDMX offered was somewhat perplexing. Only days before arriving, we were in a small colorful town where few people spoke english and spotting another traveler was a rarity. It was as though we had left Mexico entirely and were plopped down in a Parisian metropolis. The streets were clean and abundant with large tropical trees. Lined with modern restaurants and cafés, the city had an upscale euro-flavor with pockets of Mexican culture stuffed between the streets. 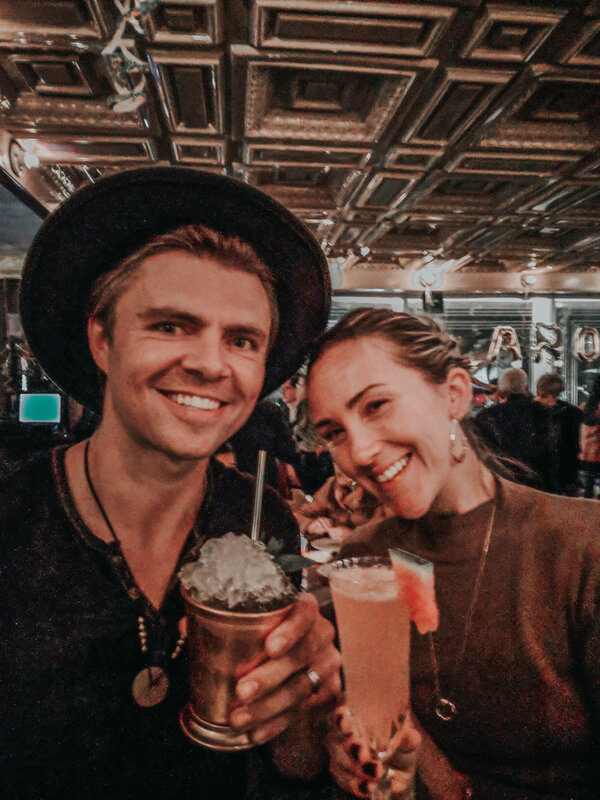 We found Vegan taco vendors selling $3 tacos, live Jazz music in a swanky velvet-encrusted speakeasy, and Belgian beers we had only ever seen in Belgium. We took full advantage of the comforts of home: for my 30th birthday (God I’m young!) we went to Le Pain Quotidien, my favorite restaurant (a Belgian-made upscale sandwich chain), had champagne on the Terazza of a cute-cute-cute bar with indoor greenery galore, and ate vegan dishes in a hotel restaurant that made us feel we like transplants of NYC’s most secret places to wine and dine. Though the prices in CDMX have far outweighed those of any other city we’ve been too, we still paid half the price of what we might have spent for a similarly indulgent week back home. NYE at La Xampa, a champagne bar in CDMX. We took our week in CDMX to eat, drink, walk, take the sightseeing tourbus, try and fail daily to get lunch before 3pm, enjoy the public parks, see The Return of Mary Poppins in theaters, and ring in the new year. We learned that for NYE, it’s a mexican tradition to have a bowl of grapes in front of you before midnight (you’re supposed to wait to eat the free grapes until midnight, but I didn’t know that). At midnight, you eat one grape for each strike of the clock. Let’s just say we had to share one bowl of grapes at midnight since I didn’t get the memo in time. On New Years Day, we woke up at 5:30am. We had packed all our bags the night before, because on New Years Day, we had a plan. We were scheduled to check out of our Airbnb and head to our next destination: Tepotzlán. However, our plan was to first ride one hour north--the opposite direction of our next destination--to witness the hot air balloons rising over the pyramids in the ancient city of Teotehuacan. The balloons take off daily at sunrise, which meant we needed to get there by 6:45am to see them lift off. When we left CDMX, it was dark, and a few people were still stumbling home from NYE celebrations. At 55 degrees Farenheit, we were already chilly, despite wearing all of our gear plus extra layers. I had Josh’s heated vest on under my jacket, as it is always colder once we start riding than when we are standing around next to the bike in our gear. We rode out of the city, carefully, knowing it was still a celebratory hour for some party-goers (not us, we are so responsible! I am 30 after all!). Luckily there were cops all over CDMX patrolling the streets, and there were few drivers besides the occasional pink and white local taxi. As we rode further north, the temperature started to drop. The sky--smoky, I imagine from fireworks--created a hazy scene as I watched CDMX fade behind me. Quickly we left the glamorous skyscrapers behind, and the hills to our left transformed into crooked and colorful houses decorated with christmas lights and glowing stars. Behind the smoke to my right, I could see some mountains framed by the dark sky. Still, the temperature dropped, and as I peered over Josh’s shoulder I could see the numbers “42” on his dashboard. An hour later, the sky had pinked up, and the morning mist made the already crisp morning feel sharper. Having now lost all feeling in my fingers, I struggled to lift my helmet up to stop the heat of my breath from fogging up my visor. Now that we had slowed down, I could tell the cold I was feeling was no longer from the windchill from freeway speeds, but from the actual temperature in Teotehuacan. About to claim defeat, we parked the bike on the side of the road. It was 33 degrees, and we were freezing. We dismounted and gazed over the barbed wire fence to our right, the only thing that separated us from the the third largest pyramid in the world. Suddenly, to our left, I heard a whooshing sound that resembled a gas stove finally catching light...but it sounded close up, as though it was right next to me, and it sounded large, almost as if--it was a giant hot air balloon. As a large shadow cascaded over us, I looked up and saw the balloon drifting over us, graceful and colossal, it felt like witnessing the underbelly of a whale floating right above me. Quickly, Josh and I struggled to get our camera on the tripod, and wondering if I’d lose a finger in the process, we set up the timer and snapped a picture. Giant hot air balloons in Teotehuacan! Giddily, we watched dozens more balloons fly over our parked bike and carry on their journey over the grasslands beside us. As they ascended, they became colorful floating confetti, gently celebrating the new year across Teotehuacan’s blue morning sky. Below them, the pyramids glowed in the sun’s first rise of the year, and the quiet scene hovered before us. On top of the Pyramid del Sol, with the Pyramid de la Luna behind me. Not too shortly after, we realized we needed to warm up with a hot drink. We found some cheap coffee at a gas station and let our hands return to a healthy pink. By 9:00am, we were warm and ready to actually enter the ancient city of Teotehuacan and witness the pyramids up close. In the sun, the memory of 33 degrees was long gone. 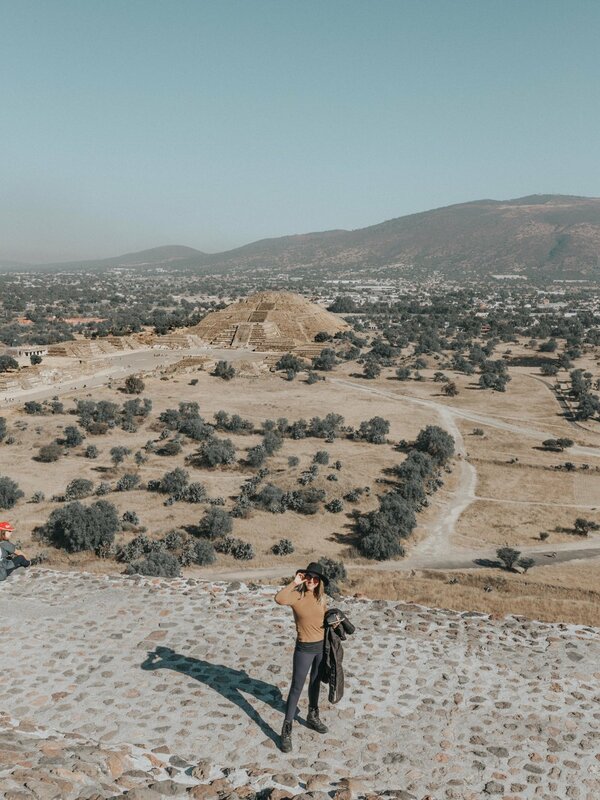 We sweat bullets as we climbed the steep manmade staircase on the Pyramid del Sol--the pyramid we beheld from afar only hours ago in the cold. At the top, we could see the ancient city’s remains below, and could imagine the vast metropolis as it was during its epoch. At the center of the city, Pyramid del Sol overlooked Teotehuacan’s main thoroughfare, Avenue of the Dead. The immense road ran perpendicular to the pyramid, and to our right we could see it lead straight to the Pyramid de la Luna. After basking in, and eventually bearing the mid-day heat, we decided it was time to get back on the bike and ride south to our next destination: Tepotzlan. This city deserves an entire post of its own, and since you are probably dead or asleep by now, I’ll end this post here.